Kat uses my bokashi in her own bokashi bucket. I read this post on Organic Gardening and was motivated to make my own bokashi bucket. It makes me pretty upset to be throwing the compostables in the garbage just because I live in an apartment building. I totally understand why there is no apartment composting yet – apartment dwellers use the anonymity to throw whatever they want in whatever recycling or garbage bin is the closest. I can’t imagine the nightmare of an apartment-sized compost bin. Boyfriend went to the hardware store and got two lovely 5-gallon buckets and drilled the required holes in one. I got my bokashi bran from The Bokashi Man [my old blog/website – Al]. It’s that easy! When the bucket is full I will let it sit for a week then dump it in my sister’s compost. There are many ways for people who live in apartments to compost in the city. Compost Here is a way to connect people who want to compost with people who have compost bins. Spread the word! New content below this post. Thanks for visiting. If this is your first time here, you can find information about bokashi in the top sections or on my website. If you have a question about bokashi or composting in general, send me an email and I’ll blog my response. I track tweets about bokashi and if I reply to one of your tweets, I do so as a public service. Instead of following me, subscribe to the RSS feed of this blog as most of what I write about bokashi will be here anyway. Thanks to Carol Browne for the photo[s]. When Todd from the Richmond Review called me to do a story about bokashi I suggested we meet where the bokashi is being used by one of my customers in Richmond. Click on the link to watch a short video. Bokashi composting may be the next big “growth” industry in the world of green—and Richmond elementary schools are leading the charge. Unlike traditional composting in which plant materials are stored in a bin and turned from time to time while the organic matter breaks down into soil over several months, Bokashi composting is a much faster process. All food waste—including meat, bones, dairy, bread and just about anything edible—is put into a bucket and “pickled” with a sprinkle of special micro-organisms called Bokashi. Invented in Japan in the 1980s, the secret of Bokashi—which, roughly translated, means “fermented organic matter”—is in the “pickling” action of its micro-organisms. When spread over food waste at eight- to 10-centimetre deep intervals in an airtight container, these organisms ferment the contents rather than simply allowing them to rot as in a traditional compost bin. The result is no foul smell, no insects and no lengthy decomposition time—even with non-organic foods like meats and cheese. According to Vancouver’s self-professed “Bokashi Man” Al Pasternak, that makes Bokashi composting perfect for condo-dwellers or those with limited to no yard space who, nonetheless, want to reduce their environmental footprint by composting in their homes. Perfect too, it seems, for Richmond elementary schools, with Quilchena, Ferris, Grauer and Maple Lane elementaries all boasting in-classroom Bokashi programs this year. Once filled, the Bokashi container does need to be dumped into a garden or standard compost bin for the final stage of its transition into soil. 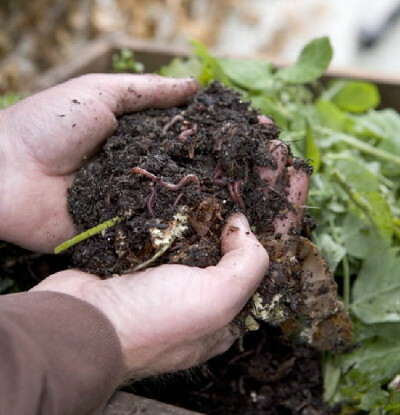 But the Bokashi advantage is that once transferred from the bucket, the Bokashi waste is typically ready to be planted in within about a month, starting a new growth-cycle much quicker than standard yard composting. “When it comes out of the bucket, the food looks exactly the same as when it went in but its chemical structure has changed completely because it’s now a pickled leftover onion or whatever it is. It’s infused with the microbes that do the pickling and it’s more wet but you’ve got no smell and it doesn’t attract fruit flies,” Pasternak said. “Bones won’t necessarily break down in the bin but they won’t smell and won’t attract critters once they go into the compost, and after they come out of the Bokashi they’re much more pliable and, if you did have a lot, could be easily broken up in the garden with a shovel blade,” he added. According to Quilchena principal Ric Pearce, his school’s student-run Bokashi program fills as many as four 20-litre buckets of food waste each month. Once the school’s four rotating large buckets are filled, they deliver them to the Terra Nova community gardens where some Quilchena classes go every two weeks to plant, tend and harvest their crop of strawberries, peas, potatoes and sunflowers, Pearce said. Last year, Quilchena’s Bokashi program delivered 43 28-pound buckets of food waste to Terra Nova, according to Pearce. That’s approximately 1,204 pounds, or over a half-tonne, of food waste diverted from area landfills and turned into nutrient-rich soil and a learning opportunity for Richmond schoolchildren. Pasternak, who may [be] the only homegrown cultivator of Bokashi in Metro Vancouver, supplies Quilchena with its Bokashi blend and delivered a refill of the micro-organisms on Tuesday. And pencil shavings are a resource that one young, enterprising Grade 6 student assured Pasternak that Quilchena Elementary has an endless, and potentially lucrative, surplus of. Andre and partner tells us about their bokashi success. Get your bokashi kit today! T writes: Have you had any experience with the bears and the fermented compost? Are they attracted to it? I live in West Vancouver and would like to order some dry bokashi mix but was wondering about the bears when I go to bury the fermented food scraps. All I can say with certainty is that the deeper you bury the fermented food scraps, less smell will percolate above ground. It is my opinion that bokashi compost does not smell like normal rotting food waste so it is less attractive to animals that may want to eat it. A few years ago, I put a large quantity of bokashi prepared food waste on a raised garden bed and covered it with straw. Purposely, I left one corner exposed and waited to see what would happen. Wasps and flies were around but never landed on it. Your own experience may vary. I hope this helps. I save organic waste for a friend who has a community garden plot. As I live in very small studio apartment with no cross-ventilation, the odour can be fairly overpowering every time I lift the lid of the ice-cream pail containing the potential compost. A friend gave me a sample of your [Bokashi] product, and it made an immediate difference to the strength (and quality) of the offensive smell. I can now continue to save this material for my friend during the summer months, rather than stopping until the cold strikes again. Thanks Sue. I really appreciate this kind of feedback.